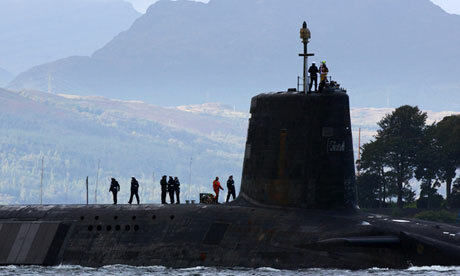 A Vanguard-class submarine carrying Trident missiles at Faslane naval base in Scotland. Britain’s nuclear-armed submarines cannot be moved from Scotland to the Devonport naval base in Plymouth because they do not have safety clearances to dock there. The disclosure has huge implications for the Ministry of Defence (MoD) if Scotland votes for independence and a new government demands the withdrawal of the nuclear fleet. The MoD has revealed that the safety arrangements for Devonport do not permit the presence of submarines carrying Trident nuclear warheads. The MoD’s safety experts are not considering changing that. The problem is that the dockyard is in a densely populated area and, if there were an accident, thousands of people would be put at risk. The worst accident scenario envisaged by the MoD would kill up to 11,000 people in Plymouth and would not meet the official criteria for what is acceptable, according to a new report. The Scottish government, which is run by the Scottish National party, has said it would eject nuclear weapons from the Faslane submarine base on the Clyde as soon as possible after Scotland became independent. A referendum on Scottish independence is due to be held in the autumn of 2014. Experts and politicians have repeatedly suggested that the Vanguard-class submarines that carry nuclear-tipped Trident missiles could be relocated to Devonport. In evidence to a House of Lords committee in December, the former head of the Royal Navy, Admiral Lord West, said “they could go there”. But a response under freedom of information law from the MoD now indicates that will not be possible. The “safety case” it has drawn up for regulators to demonstrate that Devonport can be operated without undue risk rules out nuclear-armed submarines. “Neither the Devonport naval base nor the Devonport dockyard, which is owned and operated by Babcock, safety case permit the berthing of an armed Vanguard class submarine,” the MoD said. It also disclosed that its internal safety watchdog, the Defence Nuclear Safety Regulator, “has not provided any advice on the feasibility of docking of an armed Vanguard class submarine in Devonport dockyard”. The MoD was responding to questions from the Scottish Campaign for Nuclear Disarmament (SCND), which wants to get rid of Trident altogether. “This shows that it is wrong to suggest that Trident can just move to Devonport if it is thrown out of Scotland,” said the campaign’s co-ordinator, John Ainslie. A new report by SCND applies the MoD’s criteria for accidents at Faslane to Devonport. It concludes that Devonport would never be an officially acceptable location for Trident submarines because of the much greater population that would be put at risk. There are about 166,000 people living within five kilometres of the Devonport base, compared with about 5,200 within that distance of Faslane. In assessing the dangers of a major accident at Faslane’s shiplift in 2000, the MoD concluded that the “societal contamination” that could result meant that “the risks are close to the tolerability criterion level”. If a similar accident happened at Devonport, the MoD’s tolerability criteria would be massively exceeded, the SCND report says. If there was a light wind blowing from the south-west, it estimates that 800 people would be killed by leaking plutonium. If the weather was calm, the report says that as many as 11,000 people could die from radiation poisoning. There would also be additional casualties from the blast, which could break windows across a quarter of Plymouth. The MoD’s worst-case accident scenario assumes that all the conventional explosives in the eight Trident missiles carried by a single submarine detonate. It then assumes that all the plutonium in the missiles’ 40 nuclear warheads is dispersed, amounting to perhaps 160kg. The MoD stressed that the UK government was making no plans for independence, as it was confident that Scotland would not vote to leave the UK. “We are therefore not making plans to move the nuclear deterrent from HM Naval Base Clyde, which supports 6,700 jobs, and where all of our submarines will be based from 2017,” said an MoD spokesman. This entry was posted in UK Submarines and tagged Devonport, MoD, Submarine, Trident, Vanguard on January 4, 2013 by jasonlockley.